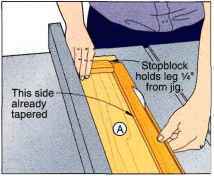 ~ Stopblock holds leg VV K, from jig. dry-assemble them upside down on your bench. Square and clamp them using a corner clamp. 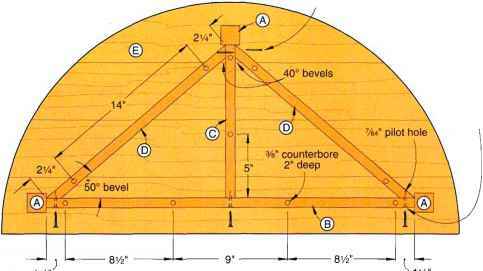 Now, drill VW pilot holes to a total depth of l'A" through the two centered shank holes on the back face of the long support (B). 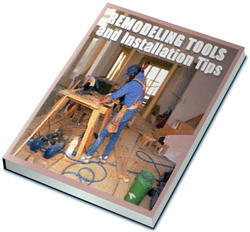 Glue and screw the supports (B,C) together using #8x1 'A" flathead wood screws. 2 Clamp the two gussets into position, where shown on Drawing 6. 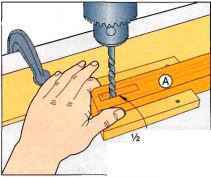 Using a depth stop on your portable-drill bit, drill %4" pilot holes through the shank holes to a total depth of 1 'A" at each end of the long support.